Outsource2india helped a leading Australian store design their furniture in 3D and effectively build over 500 different types of furniture into multiple variants and environments. Outsource2india was approached through the O2I website by a leading wholesaler and seating specialist of quality ergonomic seating in NZ and Australia. The client with over 20 years of experience in designing, manufacturing, and wholesaling of commercial seating, has a chain of retail stores across the continent. The client has over 500 types of furniture and required creation of variants in different environments. Outsource2india's task was converting artist renditions and photos into proper 3D models with dimensions and specifications and also value-add in terms of ergonomics based on the sector where the furniture is used. Some of the challenges faced were unclear sketches, proportions, and dimensions, lack of specifications, texture, and material details which are essential for creating 3D models. This meant engaging with professional designers exercising our knowledge of ergonomics to understand usability nuances for various sectors and different environments. Outsource2india started by introducing a proper file exchange system and streamlining correction process. By employing additional 3D Modelers, Texturing Artists, and Lighting Specialists the execution was initiated using different variations and environments with approvals from the client. Using 3D Studio Max, Adobe Photoshop, and Illustrator, O2I also brought about clarity by defining specifications, proportions, and dimensions along with material and texture suggestions while adding the aesthetics to the products. O2I ensured industry and country-specific standards were maintained to bring in proper ergonomic value and usability. O2I also contributed to an Assembly Manual software video for their top-of-the line products. Outsource2india's services ensured that the client saved on costs, skilled artists, and software. Further the biggest advantage was to shorten turnaround time to market. With proper specifications, material, and dimensions aligning their designs to the latest ergonomic and usability trends was made an easier task. For Outsource2india, it was a learning experience and regular business with exposure to latest trends and techniques in furniture from across the world specifically in terms of ergonomics and usability in sensitive sectors like healthcare and defense. Working with this client, we set the platform to venture out into furniture design as a service and today we are one of the leading players in offering 3D Modeling Services in Furniture Design. Outsource2india is a leader 3D modeling service provider offering customized engineering solutions to clients belonging to different domains at affordable rates. 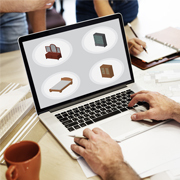 Hope you liked this success story of creating 3D furniture models.